Life is filled with challenges – some bring us success and some threaten that success. If you own or manage an apartment community (commercial occupant or unit-owners lessors risk), or if you are a homeowner association, you face a multitude of risk exposures. Fire, storm, crime, injury to others – these can happen at any time and devastate your business or damage your reputation. HK Insurance Advisors specializes in multi-unit habitation risk managment. Our Business Owners Policy (BOP) meets your need to protect your community or homeowners association against property, business income, liability and crime exposures to loss. 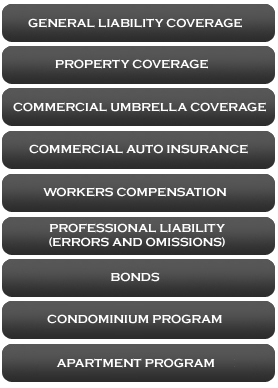 Our comprehensive programs comes with a wide variety of insurance coverages not often found in competing products. What’s more, we offer this all at a very affordable price, making the BOP an excellent value for apartment owners and associations. Ordinance or law; This important coverage protects you for expenses incurred to ensure rebuilding or removing damaged property meets local building codes. Pollutant cleanup and removal; In case of an accident or other peril, this will cover expenses due to removing pollutants from your property. Employee dishonesty; You take great care during the hiring process of your employees, but sometimes things happen that you cannot foresee. This coverage protects you against employee theft or damage to your property or that of others while in your care, custody or control.